Atelectasis refers to a partial collapse of the small airways. The majority of post-operative patients will develop some degree of atelectasis, resulting in abnormal alterations in lung function or compromise to the lung’s immune defences. It is a clinically important condition as it is often a precursor or contributor to other important, and often more severe, post-operative pulmonary complications. In this article, we shall look at the risk factors, clinical features and management of atelectasis. The pathophysiology of atelectasis is not fully understood. However, current theories suggest that airway collapse is due to a combination of airway compression (Fig. 1), alveolar gas resorption intra-operatively, and impairment of surfactant production. In atelectasis, the reduced airway expansion and subsequent accumulation of pulmonary secretions will predispose patients to developing pulmonary complications. These include hypoxaemia, reduced lung compliance, pulmonary infections, and acute respiratory failure. The degree of lung tissue involved is variable, depending on the underlying cause. Most cases seen are in the post-operative period, typically developing within 24 hours of surgical intervention. 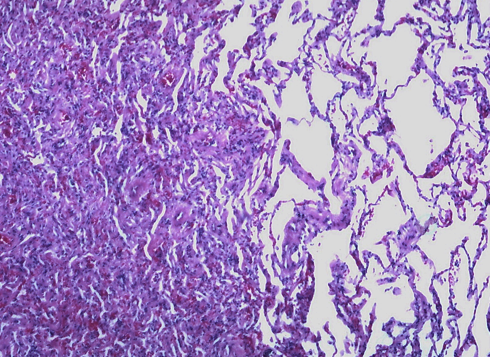 Figure 1 – Histological slide showing the airway collapse (left) seen in atelectasis. Patients with atelectasis will present with varying degrees of respiratory compromise. The most common clinical features are increased respiratory rate and reduced oxygen saturations. On examination, the patient may have fine crackles over the affected pulmonary tissue and a reduced oxygen saturation; some cases can also produce a low-grade fever. The diagnosis of atelectasis is typically clinical, especially in the post-operative patient who has developed respiratory symptoms within 24hrs of surgery. 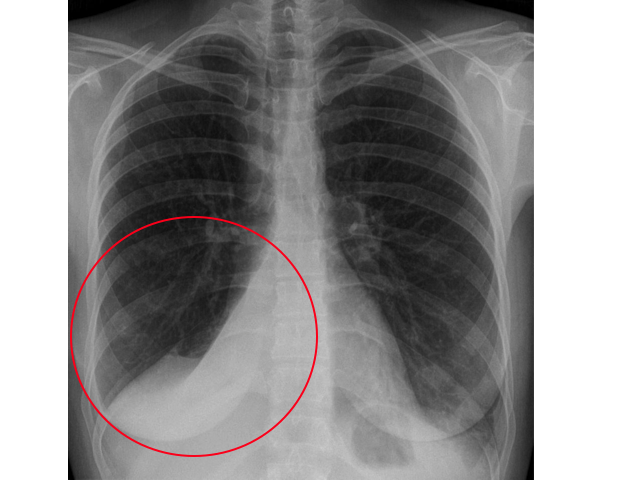 A CXR can reveal small areas of airway collapse (Fig. 2). If inconclusive and warranting further investigation, CT imaging can have good sensitivity in identifying airway collapse and reduced airway volume (although they are rarely performed for such an indication). The most effective treatments for atelectasis are deep breathing exercises and chest physiotherapy. This ensures that the airways are opened maximally and coughing can be performed effectively. As an adjunct, ensure that the patient has adequate pain control to allow them to deep breathe. If no significant improvement is seen following physiotherapy, bronchoscopy may be required to aid in suctioning out pulmonary secretions, however is not routinely performed. All patients who have undergone major surgery should be referred to receive chest physiotherapy as a preventative measure. This has been shown to significantly reduce the risk of developing atelectasis. A Cochrane Review suggested that postoperative continuous positive airway pressure (CPAP) may reduce the risks of postoperative atelectasis, pneumonia, and requiring reintubation. However, its effect on mortality, hypoxia or invasive ventilation is uncertain. Which option best describes atelectasis? What is NOT a common clinical feature of atelectasis? What is the most effective therapy for atelectasis? When does post-operative atelectasis most commonly present after surgery? Which of the following is NOT a risk factor for atelectasis?